Polyester is a common material with which to make dress shirts due to its low cost, despite being considered the poorest material by most shirtmakers. Shirts are made of woven cloth. The natural fibers used in the past were cotton (the most frequent), linen (the oldest), ramie, wool or silk. 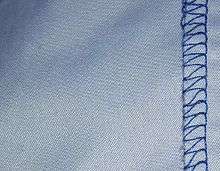 Nowadays, artificial fibers such as polyester or polyester blends are often used, due to their low cost, despite being considered by most shirtmakers the poorest material, owing to less softness and breathability. However, while high quality cotton shirts can survive with care a few decades, a polyester/cotton blend may be used in more demanding environments. Linen produces a cool fabric that wrinkles heavily, and is mostly used in light summer shirts. Cotton is therefore the standard material for all but the cheapest shirts. Silk is occasionally worn, though it is hot to wear and has a marked sheen. A dress shirt is typically ironed to remove any wrinkles and can be treated with starch for added smoothness and stiffness. 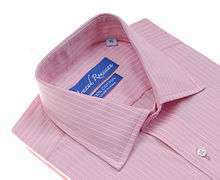 There are also cotton shirts available in the market which don’t require ironing. ↑ Brough, Dean (April 2013). "The classic white formal shirt : a powerful emblem of social change.". 15th Annual IFFTI Conference : The Business & Marketing of Icons.